I couldn't believe my eyes. 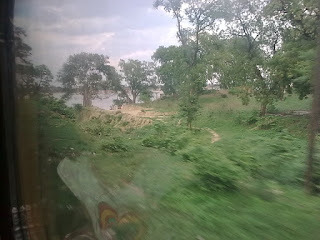 The sight was breathtaking: Azure, green and the blue all around even as the train was approaching Kanpur. I had passed the dusty town innumerable times, have even been to the place on a couple of occasions but it had never looked so enchanting. The monsoon had turned the City beautiful. 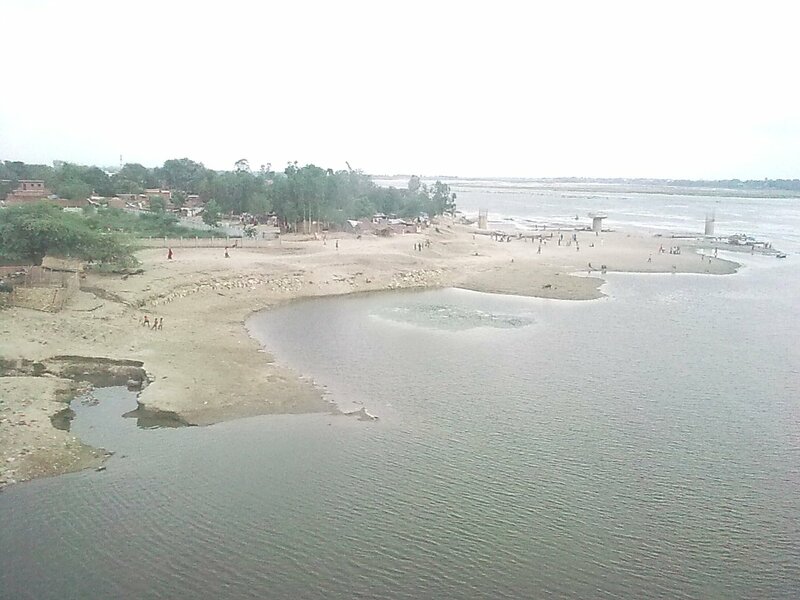 The sight of the Great Ganges was indescribable. 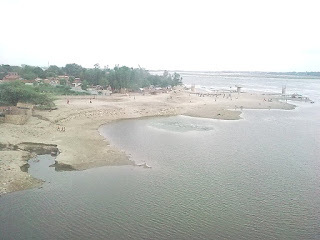 For years I saw the Ganga in the form of a narrow stream here. But this year as one passed Unnao and then read the famous signboards 'Ganga ki Chhammak nali-1 & 2', to enter the city, the overcast sky and the greenery around amazed me. The town suddenly appeared charming. Great cities are formed by great rivers. 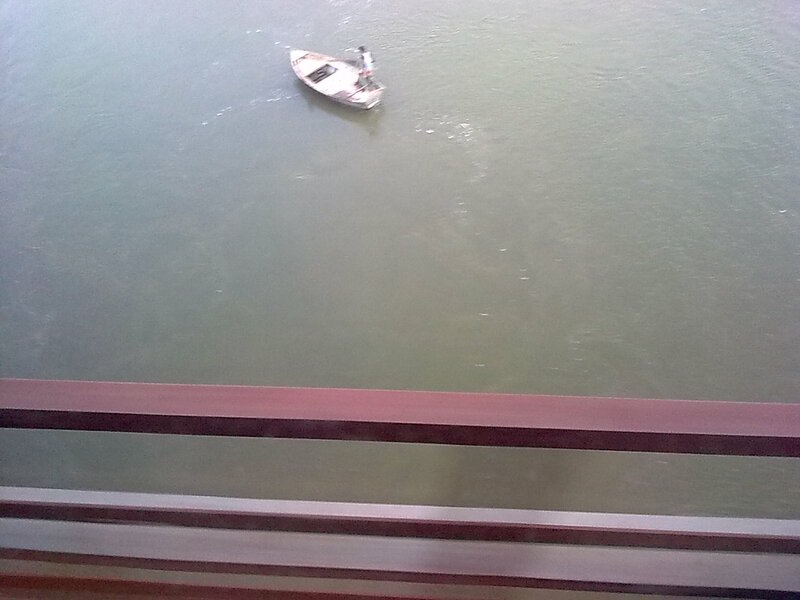 And the magical effect was of the Ganga this year. I could now realise why this city attracted people for generations, both during the later Mughal's rule, the British India and even thereafter. It was only in late 80s that the downfall of Kanpur began. On the walls, as usual there were advertisements of Hakeems promising cure for 'Gupt Rog' [sexual deficiencies], which one finds more in UP. I am familiar with the City to an extent but I don't have fond memories of the place. In my childhood, I have been to Civil Lines and some other localities. It is the place known for the famous Urdu daily Siasat Jadid and has been the hometown of poets like Fana Nizami Kanpuri, Nushoor Wahidi and the inimitable Gopal Das 'Neeraj'. Not surprisingly, the powerful Congress politician Sri Prakash Jaiswal's name is visible everywhere as the train goes across the City. He is described as MP, Cabinet member and a crusader. Phone numbers were also painted along side his name. One of them seemed to be minister's contact number. The City which was once poised to be the fifth metropolitan city of the country, suddenly lost the race in development, I think, in the period 1987-1989. In the 1990s, it witnessed communal riots as a result of which the economy got a further setback. Once it was common for citizens to mention this commercial capital of Uttar Pradesh (UP) as the Manchester of North India. Kanpur was famous for trade, textile industries & tanneries. Kanpur couldn't recover thereafter. The city [then spelt as Cawnpore] that played a major role in the first freedom movement [mutiny] in 1857 is today known for more for pan-masala production. During the 1857 revolt, Nana Sahab and Azeemullah had made Kanpur, the centre of their activity. Of course, it has IIT and some other institutions [and of course comedian Raju Srivastava belongs to the place]. Two towns that are so close rarely develop into big cities but Lucknow and Kanpur are an exception just like Lahore and Amritsar were in the pre-independence era. Now Lucknow is growing faster and may eclipse Kanpur in the next decade or so in terms of population. However, as far as civic infrastructure and development are concerned, these two big cities of yesteryear have remained far behind, compared to other middle sized Indian cities. The dust & smoke and the power-cuts [electricity] along with the density of population is what even the local residents complain of, these days. One positive aspect is that the dacoits who operated from Kanpur Dehat until a few years back, are almost extinct now. But urban gangsters have replace them in urban area and law-and-order remains another issue here. But yes, Kanpur, remains a quintessential town of North Indian that has a distinct culture of its own and a different street humour. I remember having seen the performances of fakirs, alm-seekers and vendors. Heard Ram-kathas and 'Naats' in the most amazing voice from people who board the train at outer Kanpur and get a few coins from passengers in return. The train passes Govindpuri where I see scores of working women [termed up-downers, as they shuttle from Lucknow to Kanpur for job daily] waiting at the station and trying to save themselves from the rain. Alas, I couldn't see any gazelle-eyed* beauty. The 24 compartment Pushpak Express suddenly picks up speed and the town is gone in a flash. One remembers the words of Kanpur's legendary Hindi poet Gopal Das Neeraj, 'Karwaan guzar gayaa, Ghubaar dekhte rahe'. 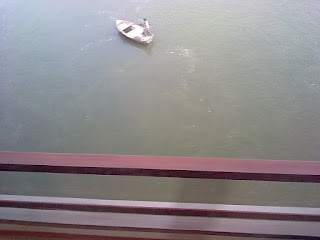 The Shahar went past but there was no 'Ghubaar'. It was just mist and rain, as far as one could see from the train's window. For now, Khuda Hafiz Kanpur. But I'll be back soon to explore the alleys of this unique town. Can Narendra Modi become Prime Minister of India?